Getting Ready for Fall with Spread the Harvest! Spread the Harvest is a project of our Grow Local program that helps Central Texas residents, school gardens, and community gardens grow and share healthy food by providing them with free food gardening resources. As part of Spread the Harvest, Grow Local held its biannual Resource Giveaway Day on Thursday, September 27, 2018. During this all-day event, we provided resources to 169 individual and family gardens, 90 school gardens, and 20 large group/community gardens in Central Texas. Keeping reading to learn more about the impact of this lively bi-annual event! Time to Reflect: To prepare for the changing season, order a Fall Celebration Herb Box from Lemon Tree Herbs. This curated and handmade assortment of herbal blends, like dandelion chicory chai or hearty tonics like fire cider, are made with local seasonal ingredients and specifically designed to keep you healthy and grounded all fall. Headed to the Fest? Don’t forget that the best snacks come straight from the market! ATX Homemade Jerky has spicy, sweet or mild offerings to keep you sustained as you wait for Metallica. Got a sweet tooth? Stop by Happy Vegan Bakery for scones and muffins to give you energy for Lil’ Wayne. Chow down on Buster’s Smoked Pecans while you rock out to Shaky Graves for heart healthy energy. Never Too Early: Start your Thanksgiving prep early by pre-ordering your turkey from one of our favorite ranchers! Stop by Smith Farm, Belle Vie Farm and Kitchen, Richardson’s Farm, or Party Fowl Farm to order your bird. Sweet Tooth: Le Renard Patisserie is using fresh carrots from JBG to make the ultimate carrot cake. Pick some up this weekend along with the usual assortment of jams, butters, scones, cookies and pies. Something Witchy: Get in the October spirit this weekend at Goodwin Homestead with her handmade (and homegrown) cob brooms! With woodburned handles, dyed gradients and more, these will definitely get you in a spooky mood. Wheatsville Coop Owners - Vote for SFC! 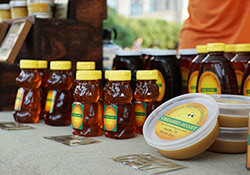 Are you a Beekeeper? Take this survey! Austin Food & Wine Alliance Now Accepting 2018 Culinary Grant Applications! 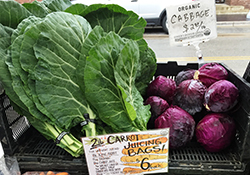 All SFC Farmers' Markets accept SNAP, WIC, FMNP and Double Dollars. Follow Us on Facebook and Instagram: Be sure to follow the SFC Farmers' Market Facebook page and Instagram to stay up-to-date on what's growing on!